Don't let your small living room pinch your style. So what if it's a tiny white box with zero crown molding? Or it's scarcely big enough for a regular-size sofa? No matter how small, it can still look stylish whether you own or rent. To prove our point, we gathered the ​best small-space décor tricks for personalizing the most lived-in spot in your home. Can't paint your white walls? Consider embracing a white-on-white interior. Pairing your walls with equally pale furniture is an elegant and straightforward way to make any small space feel brighter and larger. For character, add pops of colors and splashes of texture. Interior designer Mercedes Daczi personalized this white living room with a range of colorful and textural accents including houseplants and wicker furnishings. An awkwardly shaped living room can be baffling to decorate, but no space is ever too odd for beautiful decor. You can turn a weird wall into a focal point. The owner of this apartment turned the vertical space around her bedroom door into a salon-style gallery wall. Not sure where to put the sofa? Choosing wallpaper with a bold pattern can establish a center point in an oddly shaped area. Here peonies wallpaper anchors the living room. Turn a cramped living room into a boho haven with fabric. Houseplant expert Igor Josifovic piles on the textiles in his tiny living room with a cotton tapestry and Kilim pillows to dress up a budget sofa. We love the Turkish rug that makes sitting on the floor more inviting. Next to the woven wall hanging is our favorite décor: Igor framed a kitchen towel that was too cute to use. Design from ​Happy Interior Blog. Does your living room scream overgrown teenager? This small bachelor pad is brimming with tips for "adulting" an apartment. The elegant bike shelf keeps wheels up and out of the way while turning the bicycle into a decorative wall hanging. Another smart idea that doesn't squander floor space is the floating desk that spans the left side of the room. Its built-in drawers provide a good deal of storage. But what transforms this 500-square-foot studio into a cozy grown-up home are the various details and décor styles that add a one-of-a-kind character, from the colorful prints to the refined furniture. Nothing prettifies a living room like decorating with plants. Blooming perennials like daffodils or tulips add lovely color, while leafy beauties including ferns and spider plants bring interesting texture (plus they clean indoor air!) Don't like gardening? Try a few low-maintenance options from the succulent family and put them in cute DIY planters. If your living room is lacking architectural detail, it's easy to create an affordable and unique touch without undergoing a complete and costly renovation. Show off your personal style by creating a feature wall that transforms your room into an eye-catching focal point. A living room that's both narrow and small can be particularly challenging to decorate. However, like in this bright and airy space redone by Decor Aid, a carefully chosen sectional sofa can make the most of the precious square footage. When shopping for a sofa, look for one that is long and can lean up against a wall to give your living room more depth. If your low ceiling is cramping your style, then take a good look at these walls in a home decorated by Sheer and Company. The subtle vertical stripes make the low ceiling in this compact living room seem higher. Glamorizing a small living room isn't a problem if you watch the scale of your furniture. 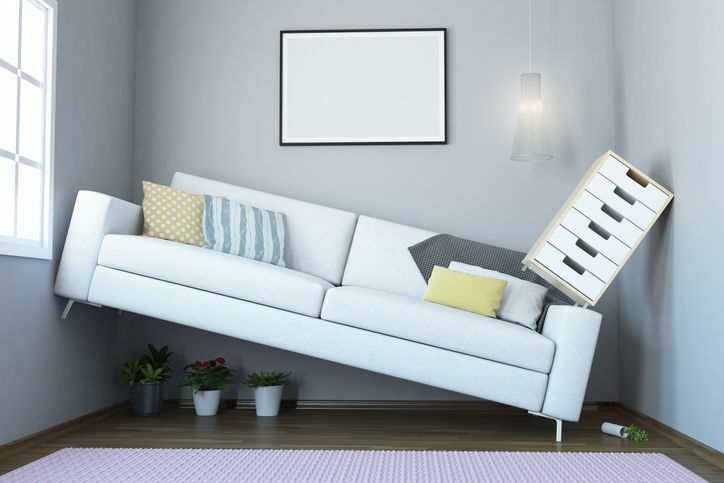 For instance, an overstuffed couch will make any small space feel minuscule. However, an apartment-size sofa that's also close to the ground (as shown) will have the opposite effect. Keeping scale in mind is also important when adding the Midas touch. All of the gold décor shown in this small living room work with the low-profile couch. But there's more! See the transparent coffee table? Since it doesn't take up visual residency, it creates the illusion of more floor space. The small living room in this luxe London apartment designed by David Long is the epitome of regal chic. A silvery-gray palette sets the stage for a layer of beautiful accessories in rich colors and lush fabrics. The cherry on top is the commissioned portrait that makes the room feel bigger by drawing the eye up. Design from David Long Designs. Adding a bookcase or shelves behind your sofa is a sneaky and effective way to add visual interest and storage to your living room. Before Scandi style became au courant, shabby chic ruled. But that doesn't mean the once wildly popular décor trend is passe. Here's a teensy living room that beautifully illustrates shabby chic style noted for its light colors, white slipcovered furniture, and vintage accents. From the comfortable love seat to the pink Fleurette armchair, the enchanting touch that completes the look is the fun-size chandelier. If you're looking to start decorating your space from scratch, the living room in this 600- square foot apartment decorated by Havenly reveals a simple formula for small space decorating. First, stick with low-profile furniture (as we mentioned earlier) in neutral colors. Leggy pieces like the coffee table create a sense of spaciousness because you can see more of the floor. For pops of color, add a houseplant or two and patterned rug. Next, fill that big blank space over your sofa with a statement-making print or oversize mirror. Need a floor lamp but don't have an inch of horizontal room to spare? Consider something wall-mounted. The petite living room in this Paris apartment had us at bonjour. The teensy space triples as the dining room and kitchen too without feeling crowded or skimping on old-world style. A few smart decorating tricks made it possible. First, furnishing it with just the bare essentials–a sofa for lounging and dining set for eating or working–doesn't squander a drop of square footage. Second, a small selection of formal embellishments from the crystal chandelier to the ornate mirror melds Parisian chic with practical function. Apartment (for rent!) from Paris Perfect. Midcentury furniture and small living rooms go together like falafel and tahini (or any other classic food pairing). How so? Many Midcentury designs, like the dining set shown on the left, are low-slung and leggy, which looks proportionally better in little rooms. Large mirrors, like the floor to ceiling mirror behind the sofa, also pair beautifully with small square footage because they visually expand the size of an area. When it comes to decorating rooms of all sizes, an alpha object is what anchors a space. In this living room, it's the plush pullout sofa which doubles as a guest bed. The nesting tables and upholstered storage ottomans also have dual purposes for entertaining and hosting. Design from decorated IDF Studio. This living room feels grander than its actual size thanks to low-slung furniture. Give your space more texture and personality by incorporating mismatched furniture and decor from different eras. Like the contemporary sofa and vintage leather chairs in this room, different textured pieces can look just as seamless as a complete set.